The OWB DropSlide by CrossBreed® combines the best qualities found in the original Snapslide and the popular SuperSlide. The DropSlide features 1 ¾” belt slots that work well with 1 ¼” and 1 ½” belts and is designed to keep your firearm tight against your body. 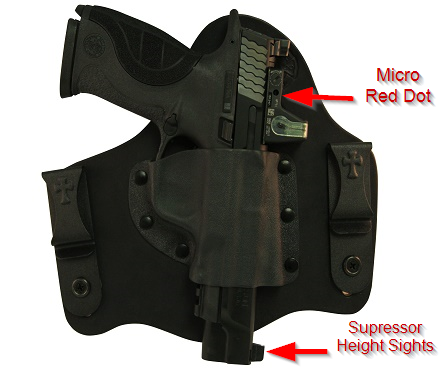 The leather backer has been reconfigured to accommodate a different position of the pocket allowing for a lower riding holster. The specially designed cut of the leather backer allows for a full grip on the firearm when drawing and extended leather on the bottom side to keep most longer barrel firearms from rubbing against your clothes and body. No matter what CrossBreed® OWB holster you choose, you are sure to have a comfortable, secure carry easily concealed with just a cover garment The DropSlide is available in our Black Cowhide, Founder's Leather and our Natural Tan Horsehide when available. 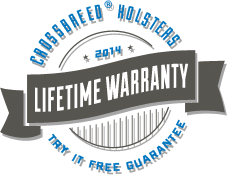 The DropSlide by CrossBreed® comes with a two week try it free guarantee and a lifetime warranty. Product Size: 7.5" x 1.5" x 5.25"